This simple pier is one of only two surviving seaside piers in south west England, the other being at Paignton, some nine miles away. The pier has a conventional timber deck supported on vertical circular cast iron columns in pairs, braced horizontally and diagonally. It was originally 700ft long. Gentlemen's bathing machines were situated to the west of the pier, ladies' to the east. It was bought by Arthur Ryde Denby with the intention of moving it to Paignton, but the idea was abandoned and a separate pier was constructed there. Teignmouth Pier was then renovated and re-opened on 24th July 1876. It was enlarged circa 1887 with the addition of a 250ft shoreward end pavilion. A small castle pavilion at the pierhead was completed in 1890. Pleasure steamers were popular daily attractions. The entrance buildings collapsed onto the beach in 1904. The jetty was removed in 1940 during World War II to prevent its use by the Germans, which reduced the pier's length by 75ft. The castle pavilion was destroyed by fire and the bridge link to the jetty was removed after the war. 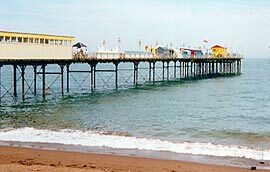 The pier was owned by the Teignmouth Pier Company during the 1970s. In recent years, new steel piling has been inserted under all the pier buildings. A new system of groynes on the beach installed to prevent erosion actually caused scour on the piles, which had to be subsequently protected using large quantities of sand and cement. The enclosed pavilion at the landward end has shops and amusements. Railing panels, small single storey buildings and fairground attractions occupy the remainder of the deck and pierhead, where a go-kart track sits on the site of the long gone castle pavilion.